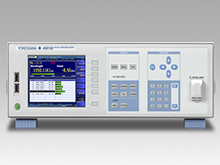 The AQ6150 Series Optical Wavelength Meter is an ideal instrument for accurately measuring the optical wavelength of optical devices and systems used in telecommunication applications from 1270 to 1650 nm (including C&L Band). By employing a Michelson interferometer and a high speed Fast Fourier Transform (FFT) algorithm, the AQ6150 series can measure not only a single wavelength laser signal, but also a multiple wavelength laser signal from a DWDM system and Fabry-Perot laser. Furthermore, this technology enables the measurement of modulated laser signals in addition to the CW signal from an optical transceiver. The optimized optical design and data processing routine significantly reduces the measurement time and improves manufacturing throughout.